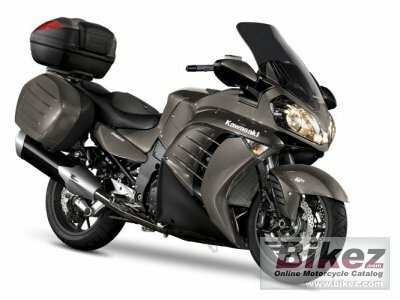 2014 Kawasaki 1400GTR Grand Tourer. Picture credits - Kawasaki. Submit more pictures. Can�t decide what to take and what to leave behind� You need the Grand Tourer 1400GTR with added luggage plus other practical luxury features. Front brakes: Double disc. Petal discs. Dual radial-mount, opposed 4-piston, 4-pad caliper. Optional ABS. Rear brakes: Single disc. Petal disc. Opposed 2-piston caliper. Optional ABS. Ask questions Join the 14 Kawasaki 1400GTR Grand Tourer discussion group or the general Kawasaki discussion group.